All Assateague Inn Studios decorated similarly, but with their own flair. Enjoy amazing View right from your Living Room. Every Studio has a Private Master Bedroom with a Queen Bed. Prepare simple meals in the Kitchenette before a day exploring our island. There is a Queen Sleeper Sofa in the Living Area. Whip up a quick breakfast before a day at the Beach. The Private Bedroom has a comfy Queen Bed. The Inn has a wonderful Community Dock for crabbing or just relaxing. Full Master Bath with Tub/Shower Combo. The Inn`s surroundings are serene and peaceful. Relax on the balcony and enjoy the sea breeze. The Assateague Inn is the place to be on Chincoteague Island. Simply stunning Views. Flex Stay allows you to check in any day you like. Take a dip in the pool on a hot Summer day. Oh, the wildlife you`ll see here. Lovely Views of Oyster Bay. 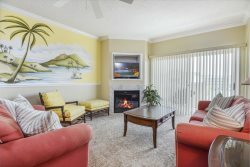 Avalon 304 - Pure Luxury at this Ocean Block Beauty in Ocean City, MD!